Brief Description: Contains concentrated iodine. Iodine is constantly consumed by tank inhabitants, therefore, without supplementation its level drops quickly. Iodine is used by corals for synthesizing pigments which allow them to adapt to variable lighting conditions and protect the fragile coral tissues from UV radiation. Iodum intensifies dark blue and purple coloration of hard corals. Appropriate iodine content in seawater tank also supports shrimp molting. 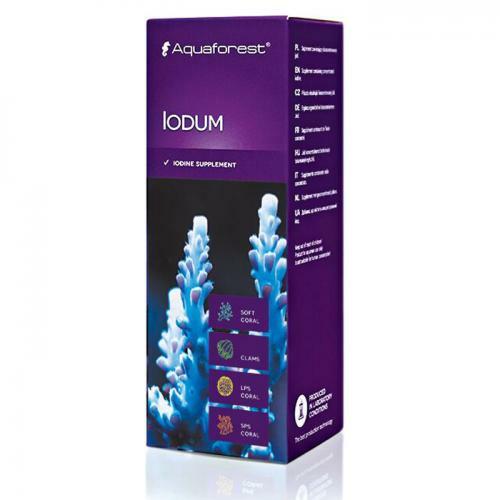 Notify me when "Aquaforest Iodum [50 mL]" is re-stocked. In marine aquariums iodine is crucial for the general cell functioning and the transfer of nutrients between them. Regular dosage of Iodum allows to keep iodine content at the same level as in the natural sea water.